From September through June, NHS publishes Advise magazine, distributed to all chapter advisers. 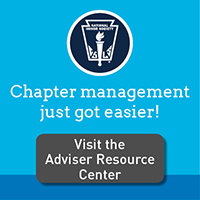 This unique resource provides informative, relevant, and motivational content to help advisers fulfill their obligations to the chapter and the school. Advise includes special “Participation Station” student-directed sections in two editions each year, so advisers can share ideas and skill-building resources with chapter members. Single issues are available for $5.00 for members and $8.00 for nonmembers. Call 1-800-253-7746, option 4 to place your order. Advise welcomes submissions about all aspects of student activity advising and student leadership development. Advise magazine is published by the National Association of Secondary School Principals for members of National Student Council, the National Honor Society, and the National Junior Honor Society.